BRASILIA (Reuters) - The far-right front-runner in Brazil's presidential race plans to put foreign policy in the hands of a diplomat who has praised the nationalist agenda of U.S. President Donald Trump that has shaken the global order, an adviser to the candidate said. Policy experts said the pick fits conservative firebrand Jair Bolsonaro's plan to make Brazil's most dramatic foreign policy shift in decades. Bolsonaro has already vowed to rethink membership in developing nation blocs Mercosur and BRICS and move the country's embassy in Israel to Jerusalem, embracing Trump as few in Latin America have done. That represents a direct reversal of nearly a decade and a half of diplomacy under leftist Workers Party (PT) governments, which focused on alliances with South American neighbors and other emerging powers. With a commanding lead just a dozen days before a run-off against Fernando Haddad of the PT, Bolsonaro has already begun naming members of a future cabinet, but has not confirmed his pick for foreign minister. Ernesto Fraga Araújo, head of the United States and Canada department at the foreign ministry, is Bolsonaro's first choice for the role, according to Paulo Kramer, a politics professor who advises the Bolsonaro campaign. In unusual behavior for a Brazilian diplomat, Fraga Araújo has used a personal blog dedicated to arguments "Against Globalism" to call for Brazilians to back Bolsonaro's campaign. But it was an article called "Trump and the West" in a diplomatic journal that showed the Bolsonaro camp how much the 51-year-old diplomat shared their world view, Kramer said. Fraga Araújo argued in the paper that Trump is saving Western Christian civilization from radical Islam and "globalist cultural Marxism" by standing up for national identity, family values and the Christian faith as Europe has not. 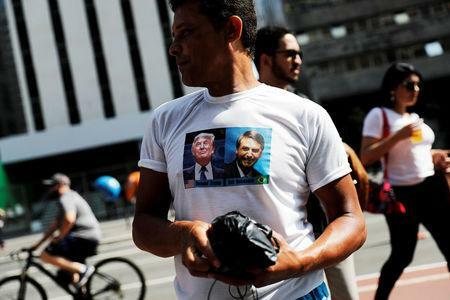 Brazil has a chance to recover its "Western soul," embrace Trump's brand of nationalism, and pursue its national interests instead of being tied to blocs of nations, he wrote. Bolsonaro has not been shy about his affinity for the U.S. president, whose 2016 campaign served as a model for his own anti-establishment movement, pledging an iron fist against corruption and crime. "Just like he wants to make America great, I want to make Brazil great," the former army captain said on the Roda Viva television program in July. He proudly saluted the U.S. flag at an event in Florida with Brazilian expatriates, according to a video his campaign posted on social media last year. Brazil, one of the world's most closed major economies, is already skeptical of free trade. But Bolsonaro has pointed to several symbolic moves underscoring an ideological realignment, too. One of the clearest signals would be moving Brazil's embassy in Israel from Tel Aviv to Jerusalem, following Trump's cue, as neighboring Paraguay has done. Brazil has long supported a two-state solution for the conflict over Palestine and in 2010 recognized the Palestinian state based on 1967 borders with Israel. However, Bolsonaro has said Palestine is not a country and vowed to move Brazil's embassy to Jerusalem and close the Palestinian embassy in Brasilia. "It's a great idea because it would signal change and say to the world that we cherish democracies that have the rule of law and independent powers with checks and balances," said Congressman-elect Luiz P. O. Bragança, who has advised Bolsonaro on foreign policy. "Israel is probably the only country in the Middle East that falls into that category. All the others are oligarchies or dictatorships," said Bragança, a member of the family with a claim to the throne lost when Brazil became a republic in 1889. Bolsonaro's attitude toward South American neighbors has been chillier, especially socialist Venezuela, which he has pledged to confront firmly. Still, his aides said he would not cut off diplomatic ties or close the border because that would shut out refugees flowing into Brazil. He has publicly disdained the fractious Mercosur trade bloc, which Brazil founded with Argentina, Paraguay and Uruguay. "Bolsonaro's foreign policy will be pragmatic. It will not discriminate against any nation and will follow the best interests of Brazil," said Kramer, his foreign policy adviser. Even the BRICS alliance, which has gained steam as Brazil set up development banks and encouraged trade with Russia, India, China and South Africa, could get a skeptical second look from Bolsonaro. Many in Brazil's foreign ministry would resist a move to withdraw. "Bolsonaro could try to get out of BRICS with a Trumpian attitude," said Oliver Stuenkel, professor of international relations at the Getulio Vargas Foundation in São Paulo. "That would send a signal to China that Brazil is becoming hostile." Stuenkel said Bolsonaro would have an easier time getting out of the Paris Climate Agreement, which he blames for tying Brazil's hands on managing land, including the Amazon rainforest. On China, Brazil's main trade partner and source of foreign investment in recent years, experts say Bolsonaro may be forced to temper his more antagonistic impulses for the sake of economic interests. Bolsonaro has warned of Chinese investors taking control of strategic natural resources in the mining and energy sectors. "China isn't buying in Brazil, China is buying Brazil," he said in August. "Are you willing to leave Brazil in the hands of the Chinese?" However, Rubens Barbosa, a former Brazilian ambassador to the United States, is optimistic that a Bolsonaro administration would shun protectionism, even when it comes to China. "Bolsonaro may have reservations about the sale of certain assets, but if Chinese investment goes into infrastructure that Brazil badly needs to export food and minerals, I do not think he will oppose it," Barbosa said.